We've made it really easy to get all the information about your account through the MY ACCOUNT screen. You can get a quick overview of your information by heading to > Membership > My Account. From here you will be able to view your basic information as well as your current account balance. Tap the UPDATE PROFILE button at the bottom to make any changes to your information. Changing data here changes the data in SwimOffice and vice versa. Tap the GUARDIAN or MEDICAL tabs to update that information and when you save your changes it will update the information across all three tabs. Be sure to tap SAVE at the bottom if you make any changes. 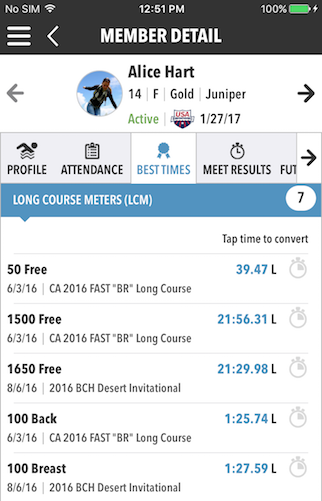 To access the details of your swimmers, scroll down to the bottom of the MY ACCOUNT screen to see them. Tap a member to view their full profile details. You can edit some of their information by tapping EDIT on the green bar at the bottom of the screen. 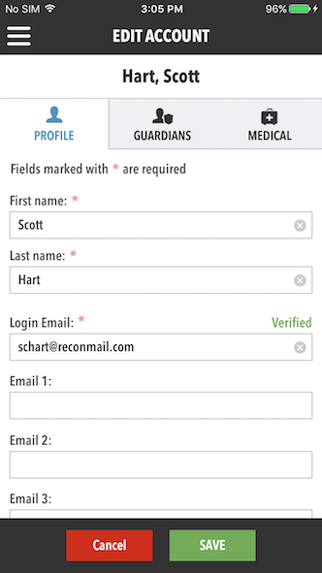 Information such as birthdate, name, and Swimmer ID can only be updated by an administrator. If any of the fields have incorrect info we recommend contacting a team's admin or coach. You can switch through your other members by tapping the arrows at the top. Tap the various tabs to view specific information. To access additional tabs simply swipe your finger along the tabs or use the lower arrows. 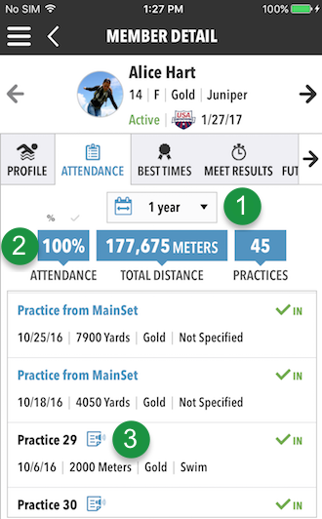 View attendance for each athlete taken by coaches in OnDeck and Coaching Tools. Allows you to select the date range for practices you would like to view. You can set a custom range if you only want to look at a specific time period. 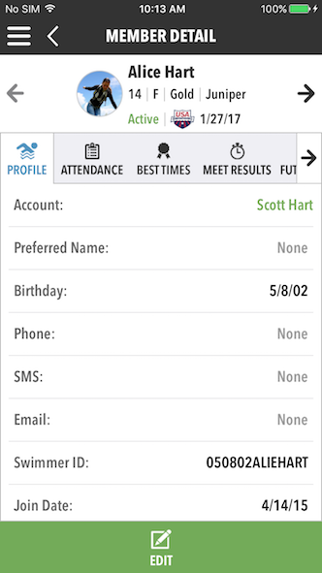 You can tap the ATTENDANCE and TOTAL DISTANCE blue boxes to toggle the information displayed. 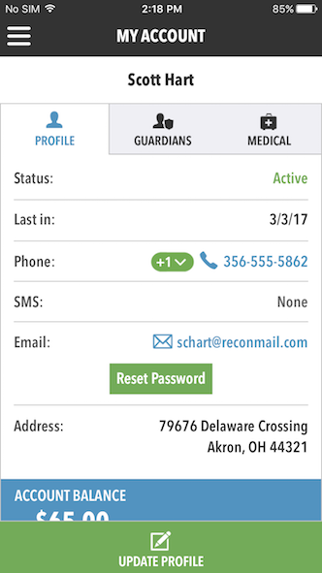 Tapping ATTENDANCE will change from a percentage value to the number of practices attended within the selected time period. Tapping TOTAL DISTANCE switches between yards and meters. If a practice was taken through OnDeck you can tap on the note icon to read or listen to a note that was left by the coach. 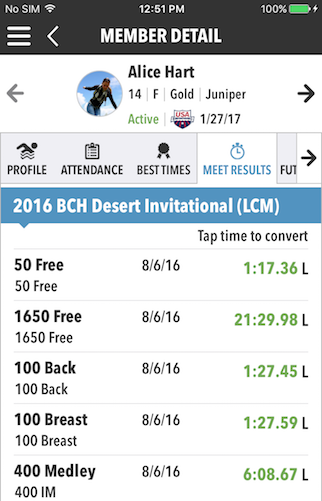 The BEST TIMES and MEET RESULTS tabs will show your athlete's personal bests and how well they have done recently. For a more extensive look at best times see below. 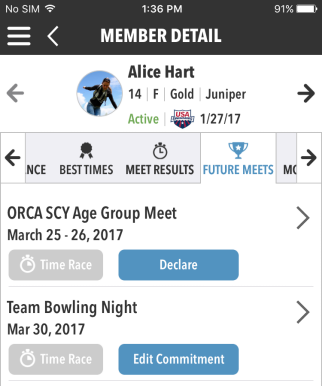 With the FUTURE MEETS tab you can easily sign up your athletes for events (tap Declare or RSVP) and view/edit events they have already signed up for (tap Edit Commitment). The Time Race buttons will turn green on the day of the event and tapping it will take you right to the Time Race section of OnDeck. 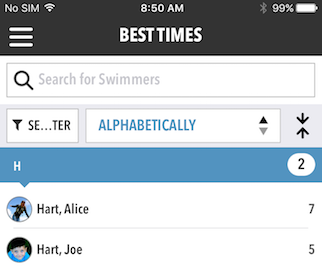 Take a look at your swimmers' best times by tapping > Membership > Best Times. These come from times imported into SwimOffice or MainSet. 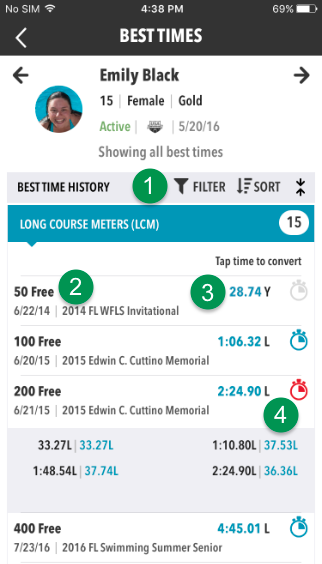 Tap a swimmer to see their times. The number of results they have is to the right of their name. 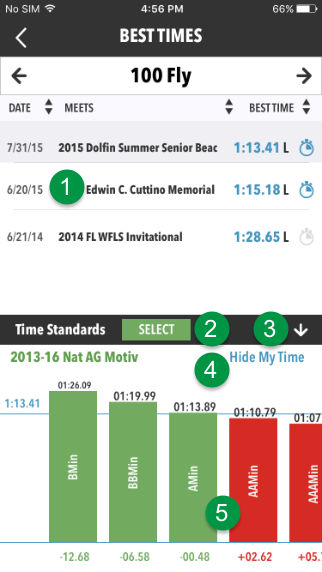 Tap FILTER to select which distances, strokes and course orders you want to see in the results. Tap SORT to sort by event or date. They will turn blue when active. Tap a result row to see all results for that event and compare with time standards (see below). Tap a time to convert between SCY, SCM, and LCM. Tap a stopwatch to see splits. The fastest time is initially selected. Tap another to see how it compares with the standards below it. 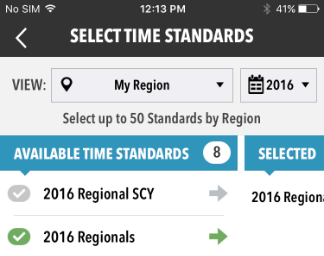 Tap to initially select time standards or pick different or additional ones. Tap to hide/show the blue horizontal line displaying the time of the selected best time. Swipe left/right to see all standards. Tap a bar to see its time standard name and cut. 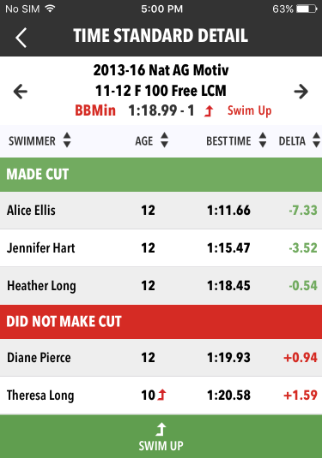 You and your swimmers can see how they stack up against selectable time standards. OnDeck will automatically default to the standards for your region. Tap Membership > Time Standards to access. Start by tapping Select Standards at the bottom. The standards default to regional standards for the current year. To change this, tap My Region, choose a region, Done. You may also tap the Year to choose a different year. Select one or more standards, DONE. Select a distance, stroke and course. Tap a standard under an age group to see who did and didn't make the cut on the right. Use the arrows at the top to cycle through the different cuts. 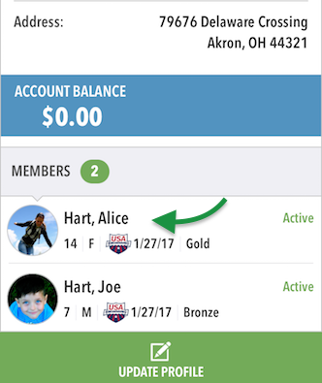 To include swim up athletes when checking a standard, tap SWIM UP at the bottom, then enter the number of years younger to include, APPLY. Up next, we cover events, meet entries and timing races.